Dr. Sangeeta Bhargava graduated from prestigious S.M.S. 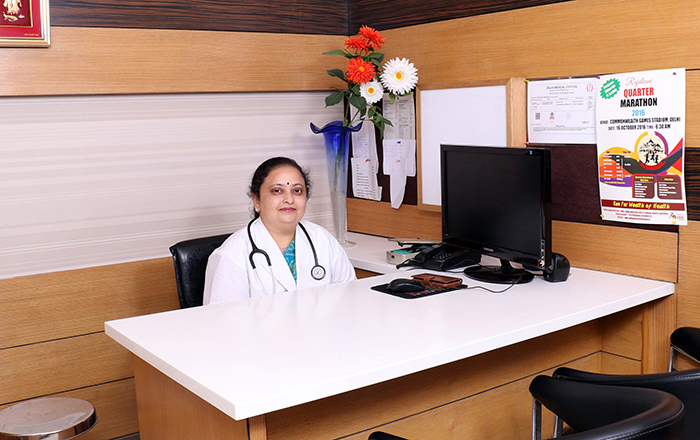 Medical College Jaipur in 1987 & has completed her post-graduation from same institute in internal medicine in 1991. She is very versatile, multidimensional & dynamic specialist in field of internal medicine with experience of more than 25 years. After post- graduation she worked at U.C.M.S. & G.T.B. Hospital & was Asstt. Professor at Santosh medical College Ghaziabad. She took special training of one year for Echocardiography & vascular doppler from Dr. K.K. Kapoor Senior Cardiologist Indraprasth Apollo Hospitals. She has been practicing in East Delhi since last two decades. Her fields of interest are Diabetes Mellitus, Hypertension and noninvasive cardiology.